154 pages | 17 B/W Illus. Flight disruptions continue to thrive unnoticed, invisibly eroding airline profitability and causing growing passenger dissatisfaction. This is especially critical at airports where traffic expansion outstrips airport capacities. Hampered by legacy information systems, management practices and organisational detachments, decision makers across the industry have little or no understanding of the multiple causes of disruptions and their implications. Consequently, their actions are focused on resolving local problems without being synchronised at system level. As problematic as they are, disruptions create opportunities for learning about system interactions, a solid and appropriate foundation for resolving complex industry issues. Beyond Airline Disruptions explains how airlines can become more competitive by utilising unexplored potential for gradual, consistent and measurable improvements, centred around cost and quality of operational performance. It describes practical methods and techniques essential for turning these ideas into daily practices. 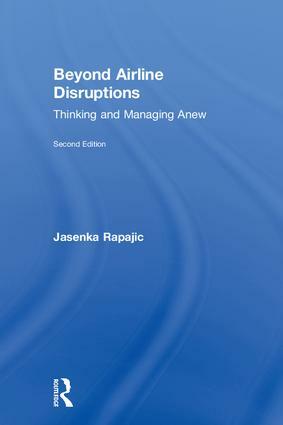 This second, revised edition features updated content that introduces a fresh approach to airline management and decision making, more in line with future industry needs. It bridges the gaps between strategy and operations and inspires collaboration between airlines, airports, ATC, service providers and regulators to bring longer-lasting benefits not only for industry participants and passengers, but also for the economy, society and the environment. Jasenka Rapajic is the founder of Astute Aviation, an airline industry consultancy specialising in modern approaches to airline management. Her diverse experience spanning strategy, planning, sales, marketing and operations, within legacy, low-cost, charter airlines and a software company, has been a foundation for a broad and deep understanding of airline and industry issues.